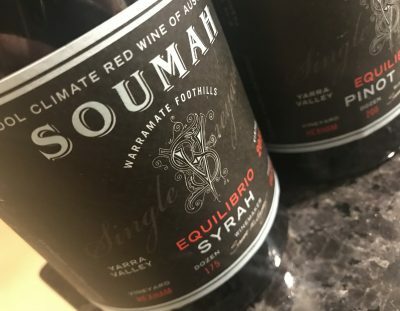 If you’ve got a vineyard in the lower parts of the Yarra Valley (ie Valley foor) and you aren’t grafting over to Shiraz (and Gamay for that matter) then you’re missing a trick. It’s the future of the Yarra, with each earlier, hotter vintage ramming that home further. This Soumah is a winner too. All R6WV28 clone fruit off the Hexham Vineyard in the Warramate foothills, it’s a super premium release with just 175 dozen produced. Capitalising on the warm vintage, and with a decent whole bunch element to give spice, this is quite a voluptuous wine, with the whispers of mint and lead pencil bouncing off ripe red fruit and cocoa powder oak with late, drying tannins. Don’t be fooled though, this is still a cool climate wine, the edges meaty, and the wine quintessentially mid-weight. But it’s mouthfilling, ripe and generous, even with a little warmth on the finish. End result is a complete package, and the finest wine yet from this label. Best drinking: Now to ten years easy. 18.5/20, 94/100. 13.8%, $68. Would I buy it? I’d share a bottle.